A stem plot plots vertical lines at each x location from the baseline to y, and places a marker there. The x-positions are optional. The formats may be provided either as positional or as keyword-arguments. The x-positions of the stems. Default: (0, 1, ..., len(y) - 1). The y-values of the stem heads. Default: 'C0-', i.e. solid line with the first color of the color cycle. Note: While it is technically possible to specify valid formats other than color or color and linestyle (e.g. 'rx' or '-. '), this is beyond the intention of the method and will most likely not result in a reasonable reasonable plot. A string defining the properties of the markers at the stem heads. Default: 'C0o', i.e. filled circles with the first color of the color cycle. A format string defining the properties of the baseline. Default: 'C3-' ('C2-' in classic mode). The y-position of the baseline. The label to use for the stems in legends. If True, store and plot the stem lines as a LineCollection instead of individual lines. 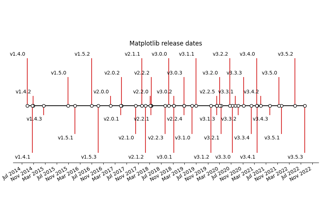 This significantly increases performance, and will become the default option in Matplotlib 3.3. If False, defaults to the old behavior of using a list of Line2D objects. 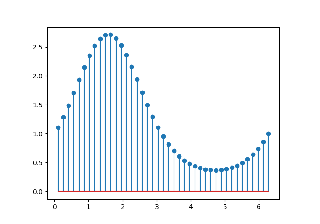 The MATLAB function stem which inspired this method.